Ready to change up your eating routine, enjoy all the benefits that come with healthy eating, and maybe even ditch dairy? 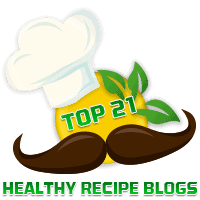 Whatever your goals for dietary improvement, you’ll find loads of inspiration in blogs dedicated to healthy recipes. Waistline-friendly versions of your favorite baked goodies, plant-based alternatives to some of the worst dietary offenders, and of course lots of deliciousness can be found online. We’ve scoured hundreds of pages and come up with this list of 21 healthy recipe blogs to inspire you as you transform your kitchen and your life. Delicious and healthy? Yes, please! The Picky Eater came to life when blogger Anjali decided to transform some of her husband’s unhealthy favorites into foods that fit into a healthy lifestyle. If you’re looking for a good place to start your journey and begin making health-conscious recipes, you’ll find lots of inspiration here. Delicious, home-cooked meals bring families and friends together, and they’re even better when they are nutritious. At Something New for Dinner, you’ll find a huge variety of healthy recipes made with real, whole foods. There’s a bit of something for everyone here – vegetarian, vegan, gluten-free, dairy-free, and paleo options help you expand your menu in a healthy way. P.S….don’t let the blog’s name fool you! There are plenty of breakfast, lunch, and dessert recipes here, too. Moderation is among the keys to healthy eating, and Carrots n’ Cake hits the mark with plenty of nutrient-dense recipes, along with the occasional decadent treat. You’ll find plenty of fitness tips here too, plus a weight loss section designed to help you meet your goals. Shepherd’s pie? Creamy broccoli soup? Rich, delicious hummus? Clean Food Dirty Girl helps you create some mighty fine eats with wholesome, plant-based ingredients. Whether you’re looking to cut back on the cholesterol or want a fun recipe to try for meatless Monday, you’ll find loads of inspiration here, along with a touch of humor and some great shortcuts to reduce the amount of time you spend on meal prep. It can be tough to transform your diet, but Sprouted Kitchen takes the task of sneaking in more produce and makes it fun. With lots of recipes designed to please picky kids and adventurous adults alike, this healthy recipe blog is one to watch for new ideas. When Blogger Meghann completed college and got her first desk job, she found herself gaining weight rapidly – and she took action by turning to a healthy lifestyle. Meals and Miles is a great source for healthy, delicious recipes, plus exercise and lifestyle tips with a good dose of lifestyle inspiration thrown in for good measure. Healthy foods that satisfy just as much as the original, fattier versions? Yes please! Skinnytaste is full of fantastic ideas for making every mealtime a healthy – and delicious – occasion. Meal planning tips, kid-friendly recipes, and a whole lot more make this a top site. Whether you’re following a vegetarian, gluten-free, Whole 30, paleo, or low-carb plan, you’ll find plenty of recipes that are so delicious you’ll have a hard time believing that they are also healthy. Roasted smashed potatoes? Fudgy vegan brownies? Mexican fried rice nachos? These are just a few examples of the life-changing recipes you’ll find when you visit A Couple Cooks. There’s plenty of variety here, with a little bit of something for vegans, vegetarians, and omnivores alike. If you’re looking for new ways to use healthy, whole-food ingredients, this is a great place to find inspiration. A beautifully photographed blog with lots of enjoyable videos to help you meet your healthy cooking goals, Green Kitchen Stories is sure to help make your time in the kitchen worthwhile. This incredible blog won a Saveur Best Food Blog award: That’s how great it is! Happyolks is a colorful, inspiring healthy recipe blog that focuses on delicious, family-friendly foods. You’ll find some completely unexpected treats inside; wonderful shortbread, some fantastic recipes for homemade hot sauce, and a whole lot more. Most of the recipes call for fresh, seasonal ingredients, and others take you on a whirlwind trip through international cuisine. Just how many new ways are there to make delicious quinoa? How can you enjoy greens at just about every meal and never be bored? The Year in Food answers these questions and more, plus it offers some enjoyable reading, with lovely photo essays that will have you running for the kitchen in no time. Memorable title, delicious contents. Yes, Sunday Morning Banana Pancakes is all about healthy eating, but there’s a whole lot more to love inside this tidy blog: Gardening tips, gorgeous galleries, and even tips for making your own candles. If you’re looking for an utterly delicious way to lose weight, find happiness, or just make something new for dinner, then you’ll find it in Healthy Girl’s Kitchen. Although this is a vegan blog, it’s one with fantastic recipes for everyone; for example, wonderful homemade granola for breakfast, comforting soups to fill you up, and for all of those who are trying to kick the soda habit, lots of refreshing drinks minus the extra calories. Southwestern Cobb Salad? Sweet Chili Baked Salmon? Creamy Sun Dried Tomato Chicken? Joyful Healthy Eats is an outstanding source for healthy recipes that give you inspiring new ways to use familiar ingredients. If you’re tired of eating the same old things or are looking for health meal planning tips, you’ll find plenty of inspiration here. Bonus: There’s a fantastic health and beauty section that’s well worth investigating. Just what does a food expert eat, anyway? A Nutritionist Eats is brimming with healthy recipes that make mealtime exciting, even when you’re watching your intake. Everything you’ll find here is simple, nutritious, and family-friendly, with great photos and concise instructions. Deliciousness abounds at Eat, Live, Run, and there’s a little something for everyone from omnivore to vegan here. Crock pot carnitas, Moscato strawberry shortcakes, and shaved asparagus and parsnip pizza are just a few of the treasures to be discovered when you check out this unique healthy recipe blog. You’ll want to lose yourself in Prevention RD’s food index for hours on end, and you’ll love the way this registered dietitian shares her positive, balanced food philosophy. Whether you’re in the mood for enchiladas or pizza, you’ll find a healthy, delicious take on these typically-fattening classics here, and much more. There’s no need to starve yourself; in fact, you can and should eat plenty of healthy food if you’re trying to lose weight. Eat Yourself Skinny shows you how it’s done in beautiful, inspiring posts that feature gorgeous photos and complete instructions. Gluten-free, dairy-free, Paleo, vegetarian, vegan, and low-carb foods are arranged by category for easy browsing. Bangkok coconut curry noodle bowls, burst tomato and zucchini spaghetti with avocado sauce, and fantastic caramelized pork tacos with pineapple salsa are just a few examples of the crave-worthy yet healthy recipes you’ll find at Pinch of Yum. Don’t miss the how-to videos! 101 Cookbooks is an absolutely gorgeous source for healthy recipes. This beautifully photographed blog offers good-for-you versions of old favorites, plus inspiring new ideas for using fresh farmer’s market finds, pantry staples, and everything in between. Simple, family-friendly recipes make Farmgirl Fare a fantastic spot for healthy recipes to try when you’re looking for a quick, easy way to break out of your food rut. The recipes use lots of basic ingredients that you might already have on hand, and many of them introduce you to new ingredients that you might not have considered using. Garden tips and cute photos of farm animals add a touch of fun! It looks so beautiful and delicious. Thanks keep sharing this type blog.